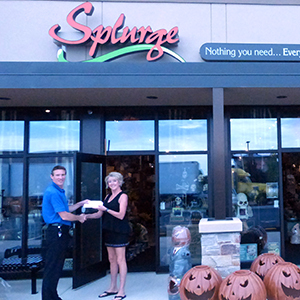 Splurge was the lucky winner of a $500 American Express gift card. Their tagline, “Nothing you need…everything you deserve!” perfectly describes the store as it features home décor, jewelry, clothing, scarves, candles, and everything else imaginable. Kelly Harnisch, owner of Splurge, is happy to be getting the internet she deserves too. “The person who handles my computers stuff said it’ll blow my mind once we get onto TDS because of the difference in speed,” said Kelly. Kelly is dealing with no shortage of problems due to internet speeds. “When everyone’s in here on their phones using the Wi-Fi, it’s just too slow.” She said. Splurge hasn’t had the best experience with internet. “It’s so slow. It’s ridiculous,” said Kelly. “That’s why I’m looking forward to getting on TDS. In our daily work, it’ll just freeze up sometimes.” She said. It’s even more of a problem because Kelly is constantly ordering things, and once the items arrive, they immediately post pictures on Facebook. Splurge is a complete reflection of Kelly’s taste. “It’s easy; I head to shows and pick out things that I like. And that’s it,” said Kelly. According to Kelly, some people say when you’re picking out inventory for stores like Splurge, you should pick a third of what you like, a third of what you don’t like, and a third of what you think someone else will like. It appears to be a winning formula as the store is in its ninth year in business and third year in Sun Prairie, with two full-time employees and three part-time employees. Splurge has a loyal following stretching to Milwaukee, Janesville and even Illinois. This makes their ability to use advertising channels like Facebook even more important. There’s no doubt the speed that comes with fiber will enhance it.